Iris Grey rents a quaint cottage in a picture-perfect Hampshire village, looking to escape from her crumbling marriage. She is drawn to the neighboring Wetherby family, and is commissioned to paint a portrait of Dominic Wetherby, a celebrated crime writer. At the Wetherby’s Christmas Eve party, the mulled wine is in full flow – but so are tensions and rivalries among the guests. On Christmas Day, the youngest member of the Wetherby family, Lorcan, finds a body in the water. A tragic accident? Or a deadly crime? The sound of the water was deafening. This stretch of the River Itchen was narrow, little more than a stream in places, but it was deep, and the current was fast, causing the ancient waterwheel to churn and splash and creak with unexpected ferocity, like a battlefield’s roar. Somewhere in the distance, church bells were pealing, fighting theirway through the din. Five o’clock. As good a time to die as any. Tying on the stone was easy, despite the darkness and the noise and the cold that numbed one’s fingers. Everything had been easy, in fact. All that fear, the stomach-souring anticipation of the act, had been for nothing in the end. Everything had gone exactly according to plan. So far, anyway. There was a symmetry to that, at least, the satisfaction of a job well done. One could even call it a pleasure of sorts. Across the bitterly cold water, the lights of Mill House glowed warm and inviting. Through the sash windows of the Wetherbys’ grand draw- ing room, a Christmas tree twinkled. Gaudy and colourful, rising out of a shiny sea of discarded wrapping paper, torn from joyously opened gifts, it had clearly been decorated by children, as all Christmas trees should be.Few things in life were sadder than an ‘adult’ Christmas tree, tastefully decked out in themed colours. Where was the magic in that? Not that it mattered anymore. Nothing mattered anymore. The water was as cold as stone, cold enough to make one flinch. But only momentarily. It was time to let go. The river opened up eagerly to receive its Christmas gift, pulling it down into the familiar black depths with the cloying, greedy embrace of a lover. Feet first. Then legs. Torso. Head. On the opposite bank of the river, a torchlight danced. Lorcan Wetherby, youngest son of the celebrated author Dom Wetherby and his wife, Ariadne, had ventured outside to play with his Christmas presents: a Scooby-Doo flashlight and a motorised toy boat, his pride and joy. Lorcan could still feel the excitement of the afternoon, when his oldest brother Marcus had pulled the big parcel wrapped in holly-sprigged paper out from under the tree. Handing out Christmas presents one by one under the tree after lunch was a family tradition, prolonging both the agony and the ecstasy for generations of Wetherby children. Lorcan had torn at the paper like a puppy, emitting a squeal of pure delight when he saw it. Exactly like the one on TV. ‘Remoke control!’ He beamed at his mother. ‘It’s remoke control!’ Ariadne beamed back. She adored her son. ‘That’s right, darling.’ Waiting for his father to put the batteries in and set the boat up had been torture. But after inhaling two slices of Ariadne’s homemade Christmas cake so quickly Marcus could have sworn he saw marzipan chunks coming out of his little brother’s nose, the boat was finally ready and Lorcan had raced down the sloping lawn to the banks of the Itchen to play with it. Dark had long since fallen. Recently Lorcan had felt afraid of the dark, and particularly of ‘ghosts’, which he saw constantly, hovering around every tree or lichen-covered wall. His father, Dom, blamed it on Scooby-Doo, a new obsession. His mother wasn’t so sure. Attuned or not, Lorcan wasn’t afraid tonight. He had seen a ghost as it happened, less than an hour ago, moving through the woods, white and tall and looming. But the ghost hadn’t seen him. He was too busy with whatever he had in his hands. Besides, Lorcan had his Scooby-Doo torch, it was Christmas, and he was at home at the Mill with Mummy and Daddy. He was safe. Cocooned. It was like Mummy said: ‘Ghosts are only people, Lorcan. Ordinary people. It’s just that you’re seeing them in an extraordinary way.’ Lorcan wasn’t sure what that meant exactly, but it made him feel better. People, in Lorcan’s experience, were nice. He played with his boat till his hands were so cold they hurt. The church bells rang. He counted them. One, two, three, four, five . . . six. Time to go in. Crossing at the bridge safely, where his father had shown him, he reached down gingerly to pull his boat out of the reeds. Behind him, he could hear the waterwheel turning, the familiar sound of rushing water that was the soundtrack to his life. Lorcan Wetherby loved the river. He loved it like a person. He loved the waterwheel and the Mill. He loved his home. His family. The boat was stuck. The spiky part at the bottom – the ‘keel’, Marcus had called it – had become entangled in something, some part of the cold, watery underworld of the Itchen. Lorcan tugged harder, but still it wouldn’t budge. Carefully setting down the remote-control handset next to him on the bridge to get a better grip, he tried again, with both hands this time, plunging his arms into the frigid water right up to the elbows. Leaning back, he pulled as hard as he could, his muscles burning with exertion as he yanked and twisted the precious boat, willing it to break free. Beneath the surface, something snapped. A small movement at first, then a bigger one, then in one great rush up came the boat, rising out of the water like the kraken. It was still heavy, still caught up in something, but Lorcan had hold of it now, the whole, beautiful vessel safe in his two strong hands. He sat back tri- umphant and exhausted. After a few deep breaths, he began to try to unwind the slimy strands still coiled round the boat’s bottom. It wasn’t reeds that had wrapped themselves, vise-like, round the keel. It was hair. Lorcan stared down in horror into the face of the corpse, its skin stretched tight and ghoulish from being pulled by the scalp. White, sightless eyes stared back at him. Not even the sound of the river could drown out Lorcan’s screams. M.B Shaw is the pen-name of New York Times bestselling writer Tilly Bagshawe. A teenage single mother at 17, Tilly won a place at Cambridge University and took her baby daughter with her. She went on to enjoy a successful career before becoming a writer. As a journalist, Tilly contributed regularly to the Sunday Times, Daily Mail, and Evening Standard, before turning her hand to novels. Tilly’s first book, ADORED, was a smash hit on both sides of the Atlantic, becoming an instant New York Times and Sunday Times bestseller. She now divides her time between the UK and America, writing her own books and the new series of Sidney Sheldon novels. “Murder at the Mill by M. B. Shaw is a great sweeping adventure. When an anonymous Christmas card from Maple Hill, Vermont beckons the Discreet Retrieval Agency to recover an antique ring at a family gathering, of course Lola and Berta jump at the chance – after all, holiday business hasn’t been such exhilarating work, and their sweethearts Ralph and Jimmy have been on the back burner. Washington. She is writing her dissertation on nineteenth-century American literature. She is also the author of the Fairy Tale Fatal mystery series. The circumstances, I do realize, were ghastly. A chunk was missing from the molasses layer cake on the kitchen table. A corpse lay, probably still warmish, out on the living room carpet. And I was aware that, having been caught in the act of removing a ruby ring from an elderly lady’s finger, my detecting partner, Berta Lundgren, and I looked as guilty as masked bandits in Tiffany’s. “We were invited,” Berta said coldly. “Aghamee do eshplain,” I said. “I beg your pardon?” Peletier said. I swallowed cake. “Allow me to explain,” I repeated. This wasn’t the plan. The plan had been to retrieve the ring, pop it in the breadbox, slink out of the house, and skip town on the next train out. At the mention of her name, Aunt Daphne raised her champagne glass. “Cheers,” she crowed. We all regarded Aunt Daphne’s fingers, which, short and plump and swollen, resembled a litter of Dachshund puppies. The too-small ring had been maneuvered to just below the knuckle with Berta’s trick of looping embroidery thread under the ring, winding the thread tightly around the finger, and then unwinding the thread from the bottom. With each loop that was unwound, the ring edged up another millimeter. The downside was that it looked rather painful. However, Aunt Daphne, drinking champagne and shoveling cake with her free hand, had yet to complain. There really are no better painkillers than cake and booze. “My mother always used butter to remove stuck rings,” Peletier said. “When you stole it,” I prompted. Phooey. It had been Berta’s idea to carry on with the ring-retrieval job even after Judith Goddard had kicked the bucket about an hour earlier. Having nothing else to do while waiting for the authorities to turn up, we had conferred in the butler’s pantry amid the family silver. I had whispered that it was unseemly to filch a ring under the circumstances. Berta had whispered, “Oh no, we did not come all the way up here to the snowy wilds of Vermont for nothing, we are finishing the job.” I had conceded. Our train tickets had been costly. Now I gave Berta a bug-eyed I told you so look. She ignored it and busied herself with completing the ring removal. “Ha-ha-ha!” Peletier slapped his thigh. “You’re an angel of mercy,” Aunt Daphne said to Berta. “Thank you. My! Just look at the divot it left behind.” She massaged her finger, and then helped herself to more champagne. “Buying that’s against the law, you know,” Peletier said, pointing to the champagne bottle. “Would you mind if I placed the ring in the breadbox?” Berta asked Aunt Daphne. Berta went to put the ring in the metal breadbox on the counter—plink—and then sat back down. Peletier pulled out one of the ladder-back chairs, sat, and extracted a notebook and pencil from inside his coat. He was small and wiry, with a flushed face, beady eyes, and tufting gray hair and eyebrows. He called to mind a disgruntled North Pole elf. His embroidered badge read Maple Hill, VT Police and featured a deer and a pine tree. “Start at the beginning,” he said. In a tumbling back-and-forth, Berta and I explained to Peletier that we were private detectives with our own small agency in New York City. How, last week, we’d received an invitation from an anonymous sender asking us to dinner at Goddard Farm, requesting that we retrieve a stolen ring, place it in the breadbox, and to subsequently expect payment in the mail. That we’d only arrived in Maple Hill earlier that afternoon, having taken the night train, and that we had rooms at the Old Mill Inn only for that evening. How Anonymous had not revealed him- or herself to us upon our arrival at Goddard Farm (really a mansion on a ridge above the village). How we’d been gobsmacked when Judith Goddard went toes-up only fifteen minutes after our arrival. “We had no choice but to fabricate an explanation,” Berta interrupted. She was serenely sawing the molasses cake. Peletier snorted and stood. “Come down to the station tomorrow morning, and if you can show me this anonymous invitation of yours, maybe I’ll let you off the hook. Until then, don’t even think about leaving town. Good evening.” He left the kitchen, Aunt Daphne drifting after him with the champagne bottle. Berta and I looked at each other across the collapsing cake. “Would it be absolutely unconscionable to leave right now?” I whispered. I felt like an absolute gink as we sneaked to the entry hall to fetch our coats, hats, scarves, and gloves. We didn’t encounter any of the family or the servants, although voices rose and fell in distant rooms. We stepped out the front door into the night. Our breath billowed in the icy air. Berta bent her head into the wind and toddled toward our rented pickup truck, an REO Speedwagon with a boxy cab and wooden rails around the bed. She winched herself up into the passenger seat. I followed, mincing like Comet or Cupid through the crunchy snow in my high heels. I took the hand crank from the cab floor, resuscitated the engine, climbed behind the wheel, flicked on the headlamps, and we were off. “Oh, it is so very cold,” Berta said with a shiver. “As cold as I remember Sweden being when I was a girl, but I am no longer young.” I inched the truck down a steep, snow-packed road. Bristling black forest encroached from beyond the headlamp beams. I was accustomed to the glitter and hum of Manhattan. Nighttime in the countryside was giving me the jumps. “I have a bad feeling about this,” I said. “We will be on our way home tomorrow.” How I wished I could believe it. 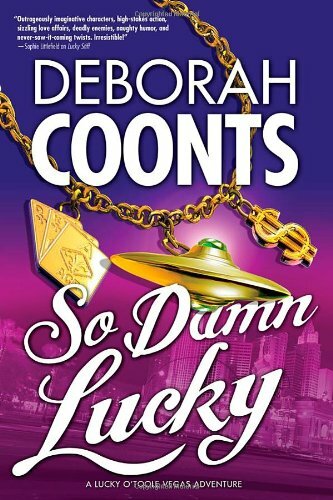 Deborah Coonts, author of So Damn Lucky, says her mother tells her she was born in Texas a very long time ago, though she’s not totally sure — her mother can’t be trusted. But she was definitely raised in Texas on barbeque, Mexican food and beer. She currently resides in Las Vegas, where family and friends tell her she can’t get into too much trouble. Silly people. Coonts has built her own business, practiced law, flown airplanes, written a humor column for a national magazine, and survived a teenager. She is the author of the Lucky O’Toole Las Vegas adventure series. Her first book, Wanna Get Lucky?, was released in 2010.